I read yesterday that The Gate, an excellent beer bar in south Brooklyn, was no longer allowing dogs after another health code violation. I used to go to The Gate once a month or so when I lived out that way. I remember the happy coincidence of walking in twice on cask brew week years ago. 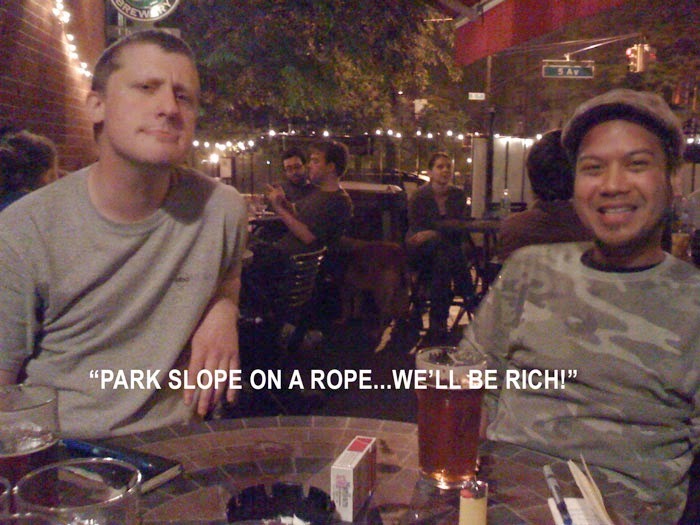 My friends Brian and Jules and I met there once and agreed to launch the now long-defunct blog Park Slope on a Rope with an initial $5 investment each. The blog never turned a profit. So, I was surprised yesterday to learn that they'd ever allowed dogs. Since Drop Off Service and the 11th St Bar banned dogs with the Bloomberg-era health inspections, I've been trying to find a place to hangout with my mutt, Otis. I started to get really down on myself for not knowing about The Gate, I would have made my way out there with Otis if I'd known he could hang. But the more it upset me, the more I realized that the most inconvenient thing in my life right now is that there isn't a bar where I can hangout with my dog. And on the scale of bad things, that's about the best problem I could imagine. So then I was happy. Until I started thinking that it could only go downhill from here. I'll try to remember this as the high water mark.